Champ Pederson won’t get a game-winning hit in the World Series this year. In fact, he’s not even on the Los Angeles Dodgers’ playoff roster. Though he’s every bit a part of the team as his younger brother Joc Pederson, an outfielder in his third season with the 2017 National League champs. Champ Pederson has Down Syndrome and is employed as an Apple Store Specialist in Palo Alto, Calif. But his day job doesn’t slow him down from celebrating with the Dodgers when they clinch division titles and secure pennants. He and his brother Joc are as close as siblings can be and have been since birth. Ever since Joc joined the Dodgers, Champ has been by his side in the clubhouse interacting with the players and occasionally delivering inspirational pre-game speeches. Champ also gives speeches at Best Buddies programs across California. Though Champ’s favourite baseball player isn’t his younger brother – instead, it’s Albert Pujols of the rival Los Angeles Angels. Champ Pederson and Pujols connected a few years ago at the MLB Home Run Derby in Cincinnati. Pujols, who participated in the contest, noticed Champ on the field and immediately went over and embraced him with a bear hug. Pujols’ eldest daughter also has Down Syndrome. The Pedersons knew The Pujols Foundation, knew the work it did for people – children in particular – with Down syndrome and other disabilities. Champ did too. From that, they figured Pujols must be a good man. 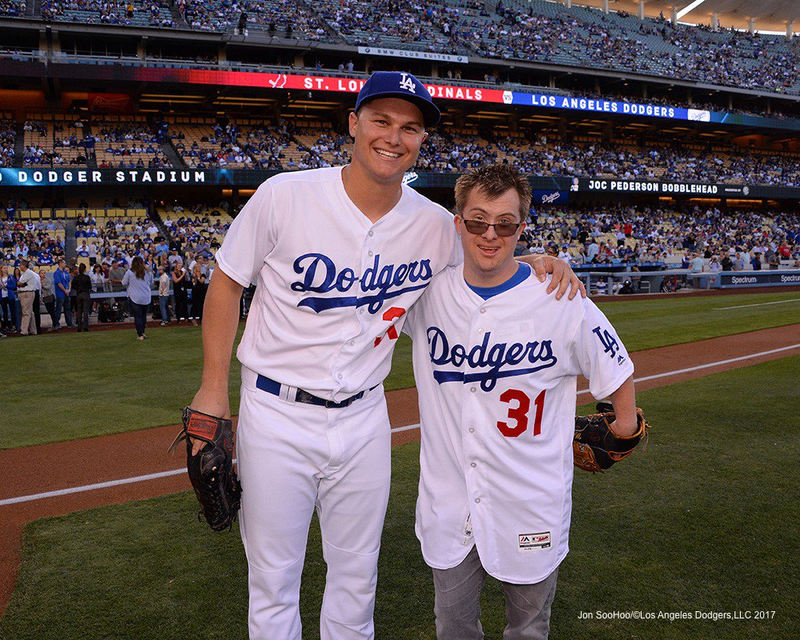 The Los Angeles Dodgers’ communications team shared this heart-warming family story with the national media in a prime example of how good public relations professionals go about their business. Nearly every professional sports organization is involved in community outreach programs. Whether it’s with local youth sports teams or helping to feed the homeless, communications teams are front and centre helping to share the story and relay it to local media outlets. Diving deeper to tell more meaningful stories, ones that will surely leave a lasting impact on even the most casual fan, are where good communications teams separate themselves from the pack. Media eat up stories like this because they know their audience will too. These stories are loaded with emotion and tug on your heartstrings and go beyond the mundane baseball rhetoric during a long season. Joc Pederson isn’t a household name, nor is he a regular in the starting lineup. But the story of these brothers will connect fans with this team and this player in ways far more valuable than what a home run or diving catch ever could. These are stories are begging to be told. Every sports team, every business, every human has a story to be told. What’s your story that will connect you to your audience?